Moist, flavorful, and mildly seasoned with fresh herbs makes this a roasted turkey that your family is sure to remember this Thanksgiving. Basted with its flavorful drippings, this delicious seasoned turkey is perfect served with any of your favorite dressing and potato recipes. See how to brine a turkey to create juicy, flavorful meat for your Thanksgiving dinner. 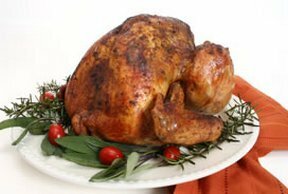 Find tips on how to check the doneness of your turkey by its internal temperature and by visual methods.